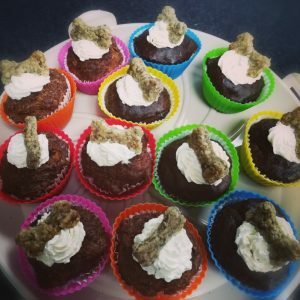 Once the freshly baked cake has cooled, I smother it with cream cheese frosting and carefully decorate it with peas and carrots, writing the special pooches name on it. I then garnish it with 1 or more, bone shaped, homemade sardine oatcakes (depends on cake size and number of letters used). And finally it is wrapped with a beautiful ribbon (except when the pooch’s name goes around the outside). A wonderful way to celebrate a special occasion. 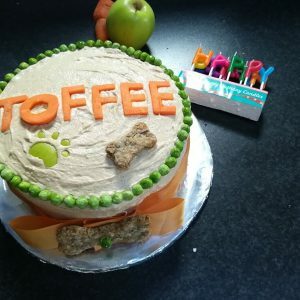 See gallery for example of cakes and dogs loving their very own celebration cake. Every cake is unique! Available in small (serves 1-3 dogs) or large (serves 4-12 dogs) size. Serving suggestions depend on dog size and activity levels. You know your pooch best! Available with peanut butter & natural yoghurt frosting. Ingredients: minced beef steak, kidney, eggs, wholemeal flour, self raising flour, cream cheese, carrots, peas, oats, sardines, water, milk.